This morning, around 6:30am, I groggily woke up, put on my glasses, reached for my phone to check the time, and noticed that it was snowing. Not a lot, but it was. “It’s snowing” I said to Sean as he began to stir. 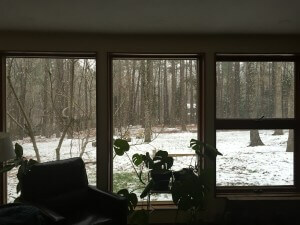 The snow was light and unobtrusive, and I really did not think that it would continue for more than a few minutes. Maybe Maya will get to see it when she first wakes up, I thought to myself. I got out of the shower. “It’s really coming down now,” Sean said as I came back in to the bedroom. 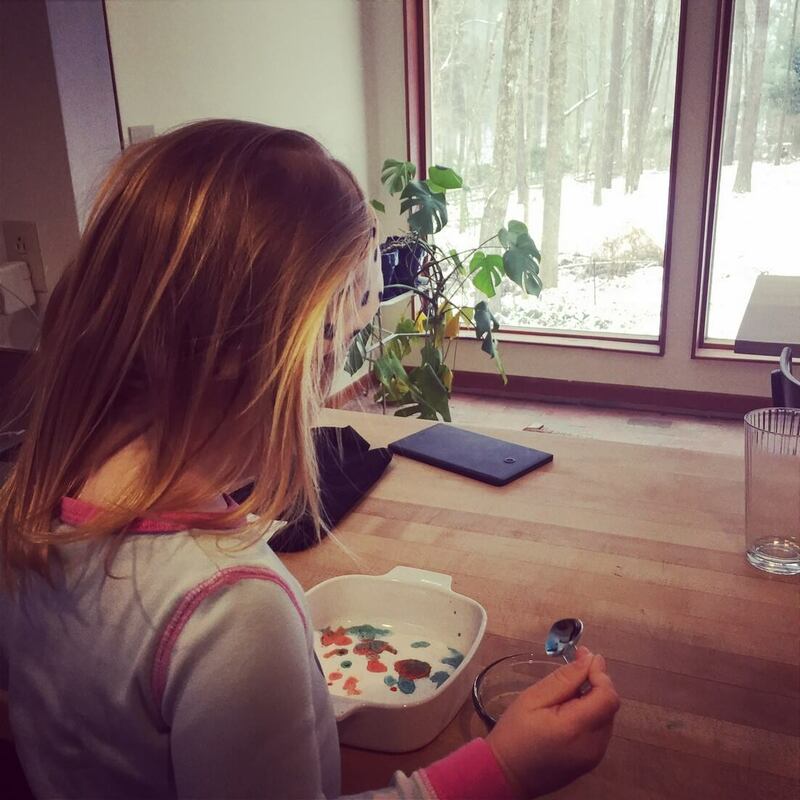 I went about my morning routine; Maya woke around 7:30am and she and Sean spent some time chatting about the falling snow while I made coffee and smoothies. I asked him to get her dressed because we needed to leave by 8. 7:40am: We get the call – two hour delay. I go back upstairs and change from my maternity “work slacks” into jeans. Maya stayed in jammies. By 9am, school was cancelled and the snow was still steadily coming down, lovely to look at. 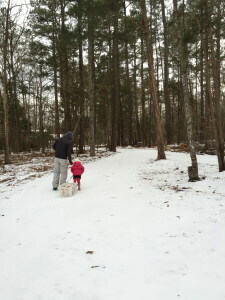 Maya is pulling her “dog sled” – she’s the sled dog. But after having THE WHOLE WEEK off last week due to a little snow and a lot of cold, I was staring down the barrel of another day stuck inside with a twonager and trying to avoid a Caillou marathon. Well, I had pinned a number of “things to try” for a day stuck inside with a kiddo, so I supposed we would go ahead and try some of those things. First, we made what I am calling “magic sand” but was really just a bowl of baking soda, some little bowls of white vinegar with food coloring in them, and two spoons. When you put vinegar on baking soda, it fizzes. 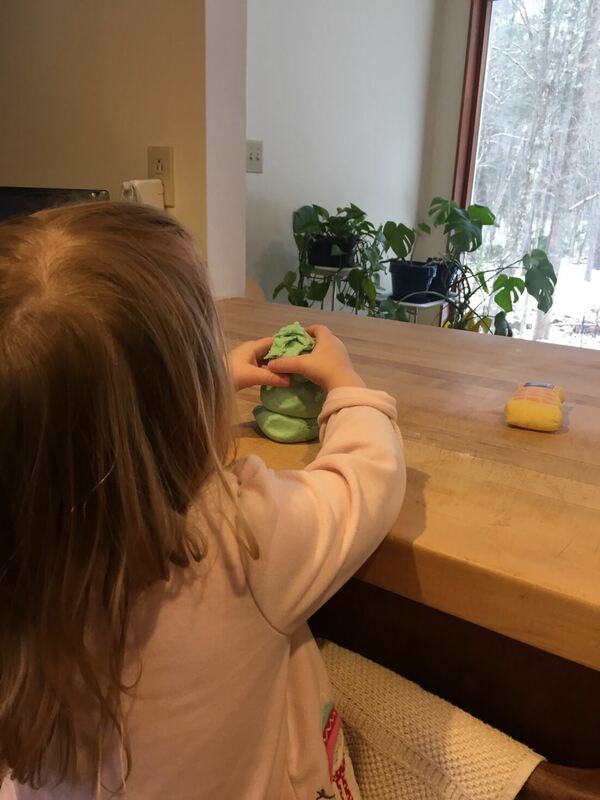 This has been A) a revolution for me in cleaning the house – thanks to Pinterest and the 9,864,3993.78 pins dedicated to the hidden uses for these two common household items and B) cool to me that it fizzes, so it was sure to entertain Maya also. Plus throw in some food coloring (I kept it limited to two because it was getting messy already) and voila – entertained kid for about 20 minutes. I count it as a Pinterest success. Next, as I tried to gear her up for nap-time with a soothing warm bath, we microwaved a bar of Ivory soap. Again, science is weird and cool. It did not break my plate, as one commenter on the original site had said, but it did get way too big, so I had to keep stopping the microwave and letting it deflate a little before continuing. 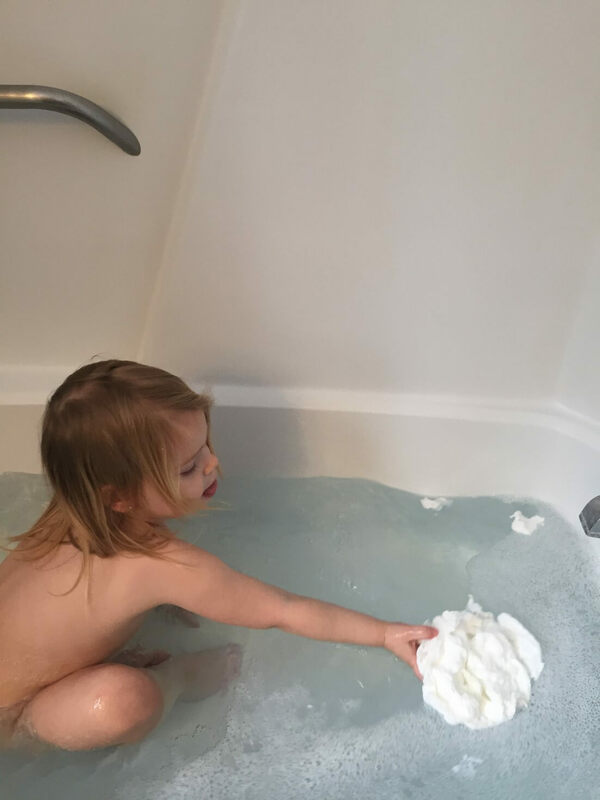 Then, it broke up pretty quickly and anti-climatically in the bath tub, but I think it was worth it to A) get Maya in the bath mid-day and B) watch it grow in the microwave for two minutes. I don’t need to worry about letting her stand with her face inches away from the microwave for that short amount of time, right? I didn’t ruin her pure-self for good with micro-waves? Sean had since braved the arctic to go to the store. He said our neighborhood and side road were bad, but the main roads were fine. 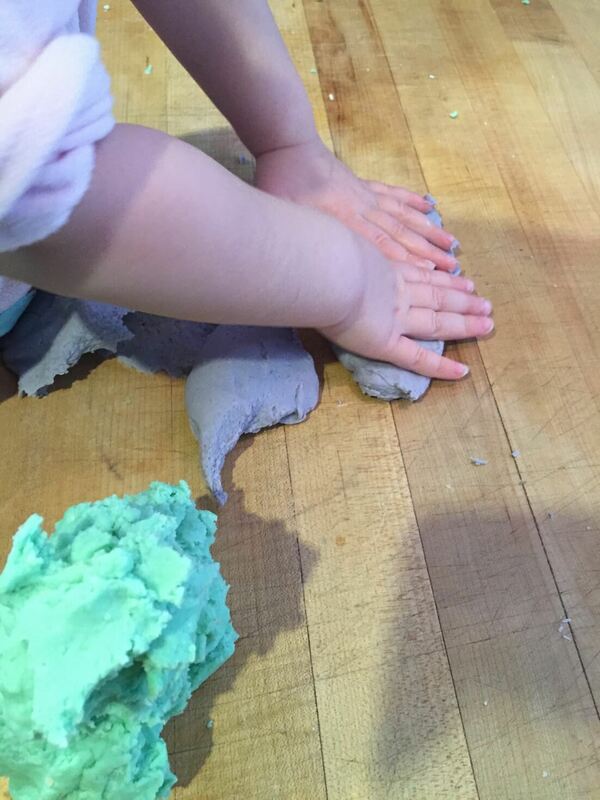 I’m glad he went, because I needed Cream of Tartar (I have no idea what this is actually used for) for our post-nap Pinterest experiment: homemade Play Dough. And yep, I was drawn to the smell-good essential oils recipe. 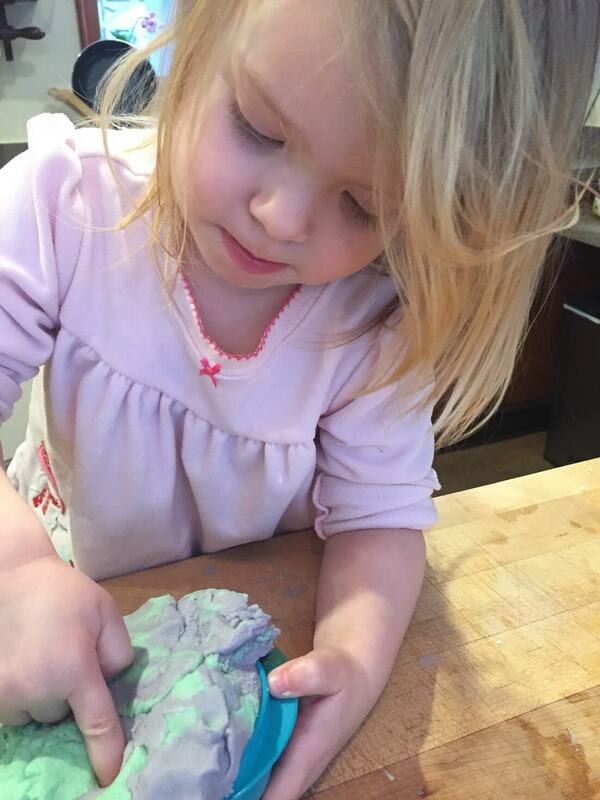 Once again, I kept the options down to two – I only had two essential oils on hand: lavender and jasmine, so Maya picked her two colors: purple and green. BIG THUMBS UP for this one. It feels so much better than store-bought play dough (at least than the off-brands we have gotten so far) and the good smells were a pleasant bonus. 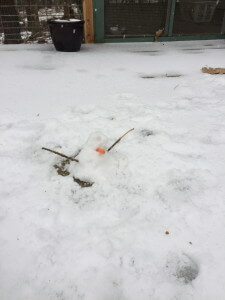 Maya made a snowman out of the dough that was much more successful than our tiny-snowman-made-of-ice from our back deck a few days ago. This kept her busy for a good half hour or so, and we can pull it out again because it’s storing nicely in an old tupperware. All in all, not a bad day for the Pinterest solutions to cabin fever, though the prep and set up and clean up all amount to about as much time as the actual playtime – but that’s something to kill the time too, so win. 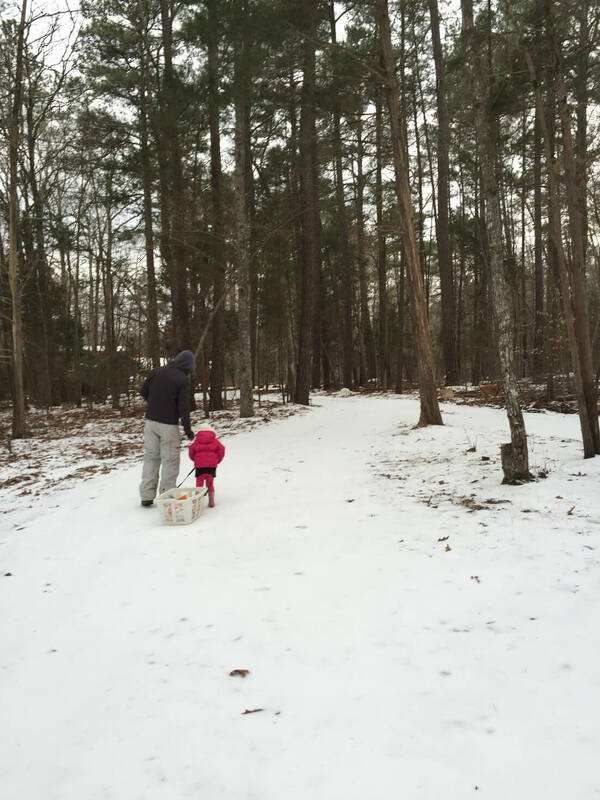 The South gets made fun of for being so darn incompetent when it comes to handling snow. We cancel school at the mere hint of a flurry and we abandon cars on the side of the road when there are more than two inches of snow – we straight up shut the f down. 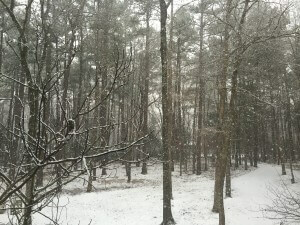 But this is what is so great about snow in the South. We like it this way. As a teacher, I can tell you that the faculty is checking weather.com more often than the students are. We are not actually that mad that our unit plan schedule has been thrown off. And sure, we’ll be bummed in May when we lose a teacher workday to make up a snow day, but that just does not dampen the child-like magical excitement that comes from an unplanned holiday. And that is what it is – a holiday. The South’s inability to function when water gets too cold is actually a great thing. I do not want to try and make it to work or push on through when I could be staying home. It’s a SURPRISE! day off. And it’s one that pretty much everyone gets! We do not get too many days where the three of us stay home as a family. Weekends are a volley of who has Bell while the other takes care of errands, weekend work, or the grasped-at alone/social time (which we always do in trade – ever so rarely together.) The grandmas have the kid during the week, so we don’t hit them up for too many weekend hours so we can have a date night. 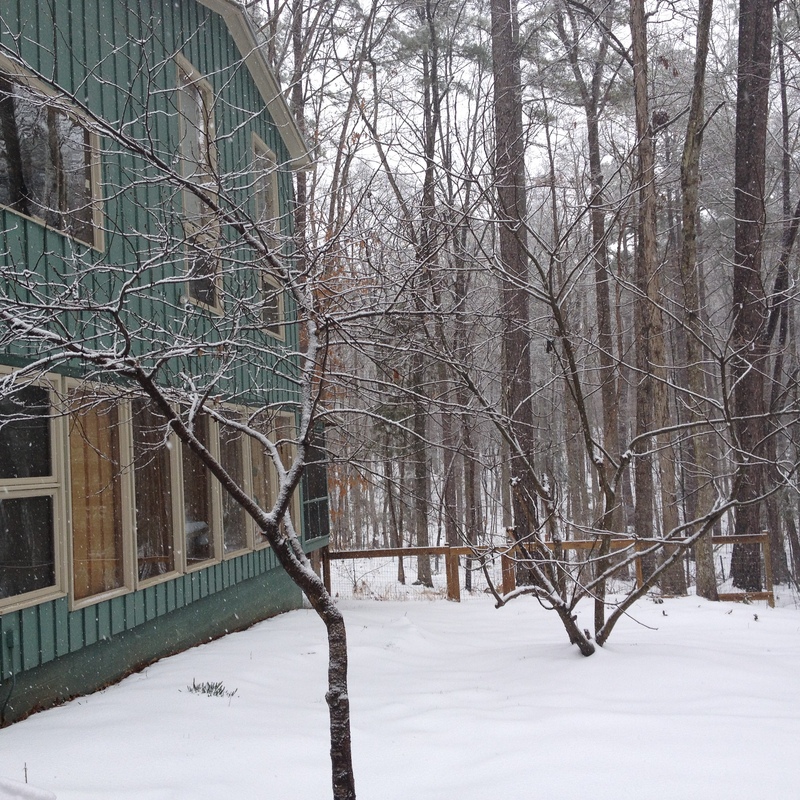 We have a lot of snow right now by Chapel Hill standards. I do not have the right clothes for this. I wore my hiking boots out today, but I clearly needed either rain boots, waterproof pants, or both. 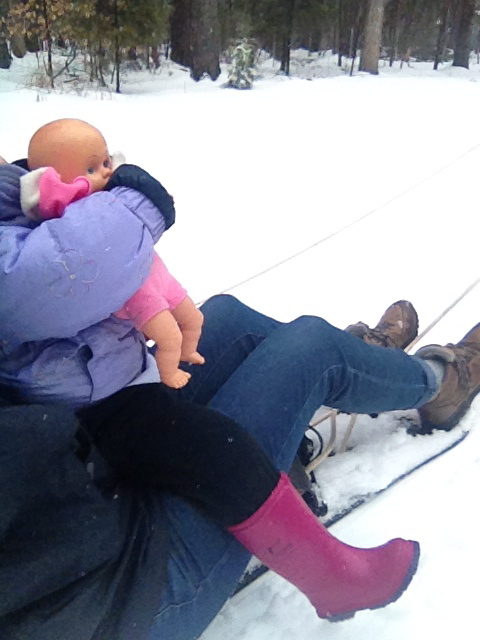 The snow was higher than my high tops – that’s way more than we are accustomed to. Meanwhile, Sean was getting out all of his old snowboarding gear and layering that on. We have been together for 7 years. I have never seen him snowboard, but he does wax nostalgic about it occasionally. He was determined to go down the tiny hill on our street. 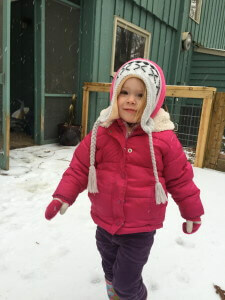 Bell made it one step into the snow, which went up past her boots, and she was DONE. She wanted to be carried. She is heavy in all those layers! 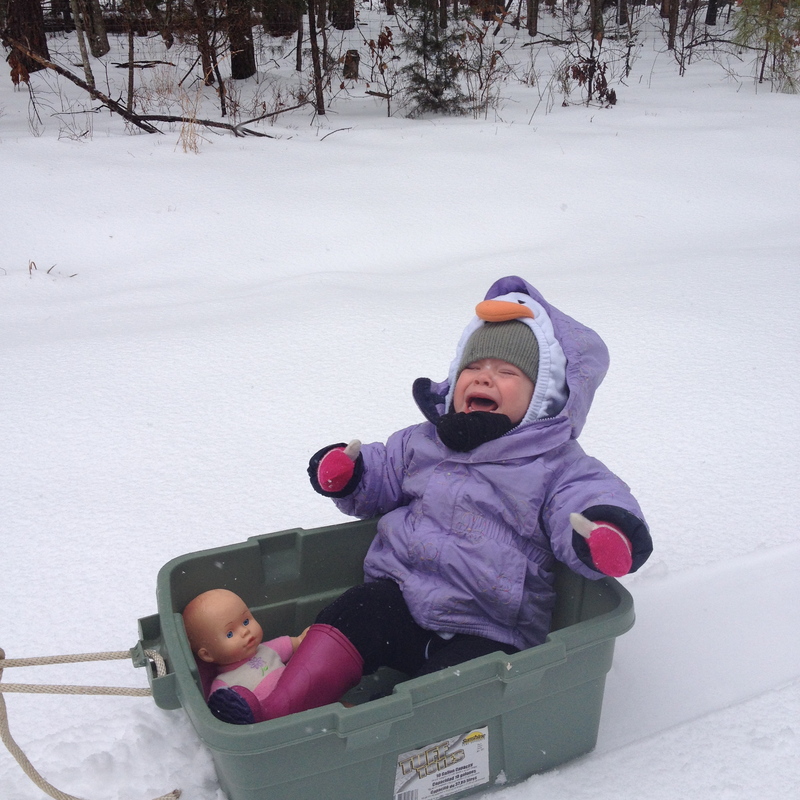 We tried to fashion a sled out of the storage container that held the snowboarding gear and put her in that, but as illustrated below, she was not having it. Sean attempted the hill – but it was not steep enough and he kind of just scooted himself down. 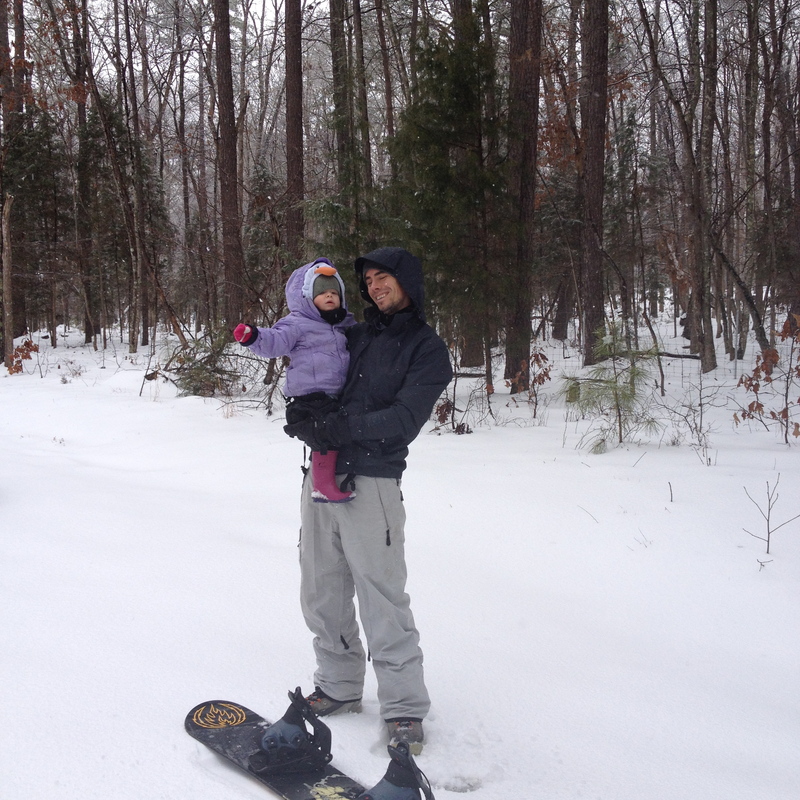 Then, he was kind enough to pull Bell and me on the snowboard, which she tolerated. My bum eventually got too wet hanging off either side of the board, but it was pretty cool while it lasted. 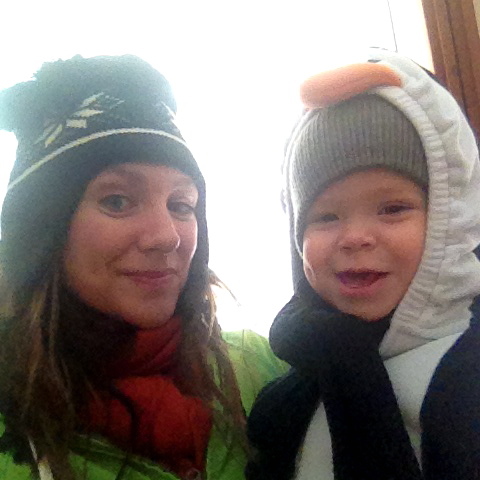 All in all, we were only outside for 15 -20 minutes – a fraction of the time it took us to get dressed and undressed for it. But it was worth it. By 4pm, we were all a little stir crazy. 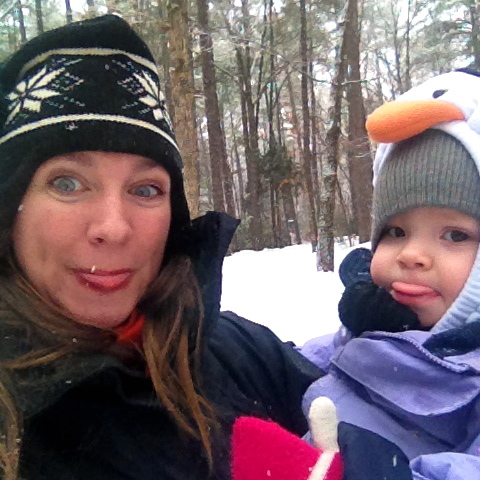 And though we didn’t stay outside as long as Penn and Kim Holderness’ family did, I still think their Snow Day video pretty much sums up how we were by late afternoon. 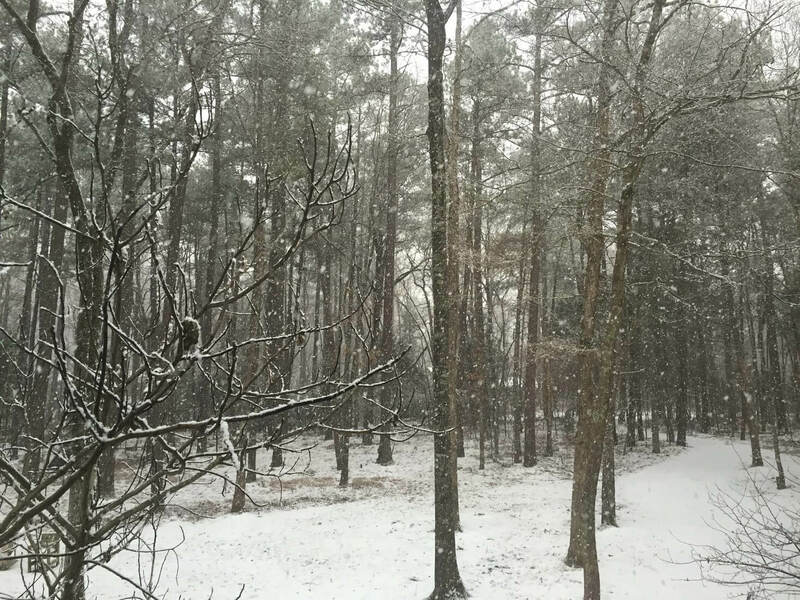 True fact: I remembered to get wine at the grocery store the day before, but we had to stop on our TWO HOUR (12 mile) trek home in the snow yesterday to get milk and eggs.